An open, multi-vendor integration with over 100 partners means customers can leverage their existing security investments. A critical advantage of the Aruba security framework is an open, multi-vendor integration of Aruba security solutions with over 100 Aruba partners in the Aruba 360 Security Exchange Program. Customers can leverage existing security investments by seamlessly integrating them with Aruba solutions. Unlike other infrastructure providers that lock their customers into costly upgrades and a single source of products, the 360 Security Exchange provides the best elements of a unified solution with the flexibility of an open architecture. Context from 3rd party systems strengthens network policies. Aruba partners in the 360 Security Exchange Program have developed security and operations features that integrate with our Aruba ClearPass Network Access Control and IntroSpect User and Entity Behavior Analytics solutions. These third-party IT systems – firewalls, MDM/EMM, and SIEM – leverage our REST based APIs, Syslog messaging, and our new Extensions repository to deliver end-to-end policy enforcement and visibility. Enterprise-grade mobile device, application, and content security for corporate-owned or employee-owned devices. MDM/EMM content exchange with ClearPass offers real time network access policies. Provides dynamic deceptions for the real-time detection, analysis, and accelerated response to cyber incidents. Detailed attack forensics and Aruba integrations drive actionable alerts and automate incident response actions. Multi-layered perimeter defense for an evolving threat landscape. When combined with ClearPass leverages real-time user and device context for accurate traffic enforcement policies. Foundational technologies for mobile device and app management on smart phones and tablets, with data protection and compliance reporting. MDM and MAM context exchange with ClearPass platform. CyberHound’s unique technology helps organizations to secure the network and optimize Internet performance. ClearPass integration enhances network security, especially for BYOD networks, through advanced threat detection and enforcement of network access policies. Application-based two-factor auth that includes geolocation, VPN, open network, role and device specific access controls. Adds secondary auth for users/devices previously authenticated via ClearPass. Envoy is changing how visitors are greeted in digital workplaces around the world. Modern businesses are getting rid of paper sign-in books and using Envoy to provide an iPad-based guest sign-in experience. Centralized administration for mobile device management, single and two-factor authentication, and SSO on Chrome, iOS and Android. Built-in ClearPass integration for MDM and authentication services. Protects against malware and distributed denial of service attacks (DDoS) by automating network control functions. Extended threat prevention via the ingestion of user and device attributes from ClearPass. 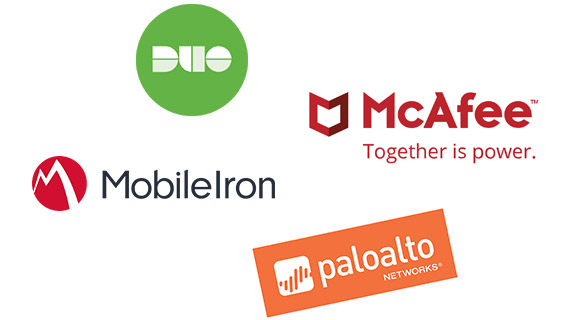 Industry-leading security suite offering mobile endpoint, application, identity access management and data intelligence. ClearPass integration for MDM, SIEM and identity access management solutions. Interactive and scalable cloud-based multi-factor authentication (MFA) for smartphone users and mobile clients. ClearPass integration provides context-based implementation of MFA for network and application access via voice, fingerprint and facial recognition. Enterprise endpoint management software that automates common IT tasks to setup, secure, and manage (update) Mac, iPhone, iPad and Apple TV. Preserves the unique Apple experience and empowers end users to be self-sufficient while providing IT with comprehensive Apple ecosystem management that integrates in your existing environment. High performance security delivered on the industry’s most scalable and resilient platform. ClearPass shares contextual user information on demand for granular user and device specific network policies. Next generation Multi-Factor Authentication (MFA) and web asset protection that is secure and easy to use. ClearPass with Kasada empowers customers to strengthen security using secondary auth challenges for mobile and in-the-office network access. 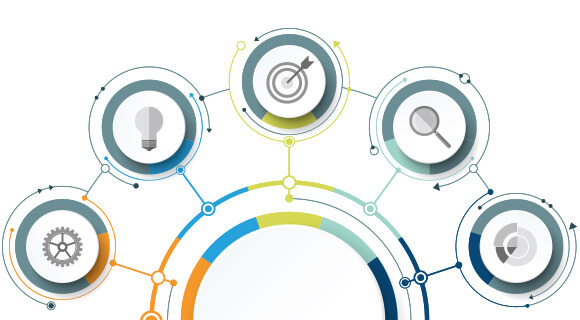 A unified, adaptive framework for real time data and endpoint threat intelligence. Combined with ClearPass delivers ePO customers the network policy and NAC platform of choice. Enterprise security management software that combines event correlation and security analytics for real time threat and incident remediation. Message exchange with ClearPass for accurate endpoint actions. Industry-adopted authentication, authorization, directory resources, and certificate management services for wired and mobile requirements. Multiple ClearPass security/identity touch points. Device, app and data management for a mobile workforce where IT-issued and personal devices can access corporate information from anywhere. Bi-directional intergradation with ClearPass is built-in. An identity and access management solution that delivers simplicity for Single Sign-On and device provisioning. ClearPass Integration delivers enhanced cloud authentication services and onboarding flexibility. Delivers centralized customer relationship services for the hospitality, spa and golf industry. Combined with ClearPass offers a simple guest access workflow that’s easy for guests and IT. Next-generation firewalls and integrated mobile security for advanced threat prevention and endpoint protection. ClearPass integration for identity-based access policies for employees and guests. Access controls that include multi-factor auth, SSO and BYOD access security. Combined with ClearPass IT delivers one-click access to all apps regardless of device, location or identity store. Service, operations, and business management solutions to streamline workflows, that ease IT service calls. Integration allows ClearPass to automatically create trouble tickets with real time user and device context. Check in visitors, contractors, and staff into any environment via the web, iPad or mobile devices. Sine visitor management includes registration, reporting, emergency messaging and now, an enhanced guest access experience. Management of corporate-owned or BYOD devices, applications, content, email, and security within a single, centralized, all-in-one offering. Contextual data exchange allows ClearPass to control access to network resources based on device identity and posture compliance. Search, monitor, and analyze data from everywhere for reporting and actionable event remediation. Combine with ClearPass for comprehensive network access authentication and event correlation. Cloud-based, voice and SMS endpoint messaging and two-factor auth for mobile security deployments built on a single API. Invokes enhanced user experience during ClearPass auth and applications access. Founded in 2014, Zingbox invented the IoT security cloud to provide visibility, security, and operational insights for the enterprise. Its technology is based on patented machine learning algorithms and uses an agentless and non-disruptive deployment. With 200+ deployments in healthcare, manufacturing, smart city, and other verticals, Zingbox has the world’s largest knowledgebase of IoT identities and behaviors. Zingbox transforms networks with scattered IoT assets into well-organized microsegments and is on a mission to provide a complete IoT governance platform–from device provisioning and securing to optimization. Discover more at www.zingbox.com/iot-guardian/. Zingbox orchestrates scattered IoT assets into well-organized microsegments by discovering and identifying them and sharing its contextually enriched data with Aruba. With its machine-learning algorithms, Zingbox learns the normal behavior of IoT assets and translates it into ClearPass zero-trust policies that only allow communications required for acceptable device operations. Working together, Zingbox and Aruba can safely provision and secure IoT assets in real-time to ensure business continuity and efficiency. With software-defined policies, Zscaler helps connect the right users to the right applications. With Aruba Central integration, you can provide seamless security for all enterprise cloud and Internet traffic.